With Commedia Erudita, or the learned comedy, we enter Commedia dell’Arte from an above angle. This is the amateur, or dilettanti , scripted theatre played in the courts and academies by the nobles and scholars there. It came to the courts, not only by the jesters and minstrels that traveled from court to court as we have seen in THE CHURCH, but also through the newly formed literary academies. The literary academies were not only dedicated to the written world. They held debate competitions, improvisations over specific subjects and learned about rhetoric. At the time rhetoric was something very physical, where accentuation, gestures and postures were just as important as the actual words. In the early renaissance, with its obsession for the classical world, the classical plays, like those by Terence and Plautus, were rediscovered by the scholars. They were acted in the academies. The scholars started write and stage their own comedies with inspiration from the classic source. They commented frequently each other in their plays. After first have been writing in Latin, like Niccoló Maciavelli or Cardinal Bibbiena, they later started to write in local language, like Pietro Aretino, Ludovico Ariosto or Angelo Beolco. The latter is also called “the Italian Shakespeare” and came even closer to Commedia dell’Arte with improvised moments and characters defined by different dialects and local types among other elements. It is in the meeting between those learned amateur groups and the hardworking professionals that Commedia dell’Arte found its form. 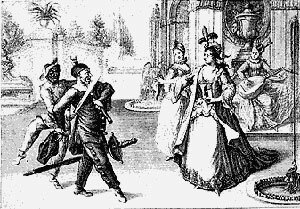 Note that most of the Commedia dell’Arte we know of is from the performances played in the courts of the different states in renaissance Italy and that many of those who acted there became Commedia dell’Arte actors. For example: Tristano Martinelli and Francesco Andreini both were noblemen and consequently Isabella Andreini also married in to aristocracy. This is also one reason why Commedia dell’Arte was somewhat respected as an art form.